Brain-based lesson planning does not follow a template—mainly because the basic premise of brain-based learning is that every brain is unique, so a one-size-fits-all approach does not work. Learning different things requires different approaches for different people, depending on variables such as prior learning, experience, preferred modalities, and the type of skill being taught. Thus, a toolbox rather than a template is the basis for brain-based lesson planning. There is a wide range of tools that help encourage the brain to absorb, process, and store experiences and information meaningfully. The following general strategies reflect a brain-based approach to lesson planning. They are followed by a more detailed sequence of guidelines that reflect the seven stages of learning. Pre-expose learners to new material in advance. The more background they have, the greater number of connections they’ll make. Discover your students’ background in the subject, and customize your planning to their experience level and preferred learning style. Create a supportive, challenging, complex, no-threat classroom environment in which questions and exploration are encouraged. Ensure that your materials and presentation strategies are age appropriate. Acquisition happens both formally and informally; provide learning experiences that reflect real life. Always plan for elaboration. Presenting is not learning; students must process the learning before they own it. Help learners encode learning in their memory with appropriate use of downtime, emotions, real-life associations, and mnemonic techniques. Functional integration happens only over time and with repeated reviews. This stage provides the brain with an overview of the new learning before really digging in. Pre-exposure helps the brain develop better conceptual maps. Post an overview of the new topic on the bulletin board. Mind maps work great for this. 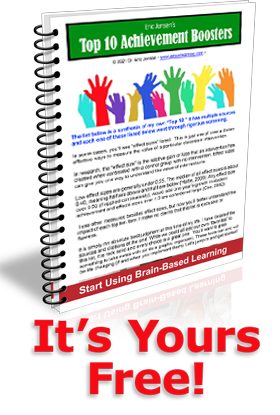 Teach learning-to-learn skills and memory strategies. Encourage good brain nutrition, including drinking plenty of water. Model and practice coping, self-esteem, and life skills. Create a strong immersion learning environment. Make it interesting! Consider time-of-day brain cycles and rhythms when planning morning and afternoon activities. Discover students’ interests and background; start where they are in their knowledge base, not where you think they are. Have learners set their own goals, and discuss class goals for each unit. Post many colorful peripherals, including positive affirmations. Plan brain “wake-ups” (e.g., cross-laterals, relax-stretching) every hour. Plan activities during which students can move around and choose from a menu of offerings. State strong positive expectations, and allow learners to voice theirs, too. Build strong positive rapport with learners. Read your students’ learning states, and make any adjustments as you proceed through the lessons. This is the stage at which you create curiosity or excitement. It’s similar to the “anticipatory set” but goes further in preparing the learner. Create a “you are there” experience; give learners a real-world grounding. Provide the context for learning the topic (can be a repeat of the overview; the classic “big picture”). Elicit from learners what possible value and relevance the topic has to them personally. They must feel connected to the learning before they’ll internalize it. Encourage them to express how they feel it is or is not relevant. The brain learns particularly well from concrete experiences first. Provide something real, physical, or concrete. Conduct an experiment, go on a field trip, or invite a guest speaker who is professionally involved with the topic. Create complex interdisciplinary tie-ins to the session. Provide a “hook,” a surprise, or a bit of novelty to engage learners’ emotions. Stage 3: Initiation and Acquisition. This stage provides the immersion. Flood with content! Instead of the singular, lockstep, sequential, one-bite-at-a-time presentation, provide an initial virtual overload of ideas, details, complexity, and meanings. Allow learners to feel temporarily overwhelmed. This will be followed by anticipation, curiosity, and a determination to discover meaning for oneself. Over time, it all gets sorted out brilliantly by the learners. If that sounds like the real world of learning, outside the classroom, you’re right: it is. Provide concrete learning experiences (e.g., case study, experiment, field trip, interview, hands-on learning). Provide activities that employ a majority (if not all) of the multiple intelligences. Offer a group or team project that encompasses building, finding, exploring, or designing. Attend the theater, put on a skit, produce a commercial, or create a class/school newspaper. Provide enough choice that learners have the opportunity to explore the subject using their preferred modality: visual, auditory, kinesthetic, and so on. A well-designed computer program can be helpful at this stage. This is the processing stage; it requires genuine thinking on the part of the learners. This is the time to make intellectual sense of the learning. Provide an open-ended debriefing of the previous activity. Tie things together so that learning across disciplines occurs (e.g., read a science fiction story about outer space while studying the solar system, discuss how literature relates to science). Have learners design an evaluation procedure or rubric for their own learning (e.g., write test questions, facilitate peer reviews, design mind maps). Have learners explore the topic online or at the library. Watch a video, view slides, or see a theatrical production on the topic. Stimulate small-group discussions, and have groups report back to the entire class. Create individual and/or group mind maps reflecting the new material. Hold a school forum, debate, essay contest, or panel discussion. Have students do the teaching (e.g., in small groups, as class presenters, in pairs). Stage 5: Incubation and Memory Encoding. This stage emphasizes the importance of downtime and review time. The brain learns most effectively over time, not all at once. Provide time for unguided reflection—downtime. Have learners keep a journal of their learning. Have learners take a walk in pairs to discuss the topic. Provide stretching and relaxation exercises. Ask learners to discuss new learning with their family and friends. Stage 6: Verification and Confidence Check. This stage is not just for the benefit of the teacher; learners need to confirm their learning for themselves as well. Learning is best remembered when students possess a mode or a metaphor regarding the new concepts or materials. Have learners present their learning to others. Ask students to interview and evaluate each other. Encourage students to write about what they’ve learned (e.g., journal, essay, news article, report). Have students demonstrate learning with a project (e.g., working model, mind map, video, newsletter). Let students present a role-play, a skit, or a theatrical performance. Quiz students (verbally and/or in writing). Stage 7: Celebration and Integration. At this point, it is critical to engage emotions. Make it fun, light, and joyful. This stage instills the all-important love of learning. Never miss it! Have a class toast (with juice). Provide sharing time (e.g., peer sharing, demonstration, acknowledgments). Play music, hang streamers, and blow horns. Invite another class, parents, the principal, or community guests in to view projects. Facilitate a class-designed and –produced celebration party. Incorporate the new learning in future lessons. Never introduce something and then drop it. If it’s not important enough to refer to in the future, don’t waste time on it to begin with. As we plan learning with the brain in mind, (it) is critical to ask a different set of questions. Rather than ask “What should I teach?” ask “How will students best learn?” As you plan the learning, keep the focus on the basic principles that support the brain’s natural learning tendencies. Follow through from pre-exposure to celebration, making sure that none of the stages in between are skipped. Learning happens over time. Create a complex, integrated, interdisciplinary curriculum that provides for plenty of learner choice. Provide structure, but in an environment that respects each learner’s unique nature, needs, and experiences. Thank you for providing this Brain Based Learning approach. Years ago I was fortunate that one of my children’s teachers used this modality in teaching. As I am now working toward becoming an Education Specialist, in Intern program. I really hope to become the best teacher I can be. I plan to find ways to develop a Multiple Intellegence approach. I am concerned about the educational limits that Standardized Tests created. (I remember Robert, my daughters teacher saying, “ I teach to the whole child, not teach to the test.) I hope to give to others what my child received from such an excellent teacher. Suggestions?? ?